Walmart has joined forces with Ford to explore delivery with autonomous vehicle technology. The trial programme is taking place in Miami-Dad County, using Postmates as delivery partner. 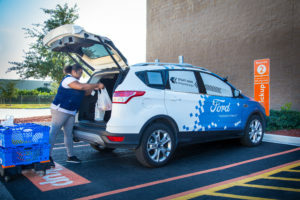 Tom Ward, senior vice president of digital operations at Walmart US, said: “Through it, we aim to learn more about how we can take advantage of self-driving vehicles to deliver fresh groceries – hand-picked by our personal shoppers – to customers.